If you can't bear to leave the house without makeup, you may be wreaking havoc on your skin. While some people experience very few side effects from wearing cosmetics such as foundation, powder and lipsticks, others aren't so lucky. Chemicals found in many of these products can create a range of adverse reactions that undermine your daily beauty regimen and damage your skin. A thick oily sheen on your face isn't the same as having a youthful glow. Oil-based foundations and creamy powders give a slick appearance and cause eyeliner to smudge or your eye shadow to clump up in the crease above your lid. For a smoother, fresher appearance, avoid oil-based makeup, especially if you already have oily skin. Stick to water-based foundations and loose powders, instead. If your skin is naturally dry, using oily makeup isn't the answer. Proper cleansing and moisturizing is. In some cases a foundation or powder may dry out your skin and make it look flaky, dull and ashen. These cosmetics may also cause cracks and fine wrinkles in your skin, explains the American Academy of Dermatology, which could cause an infection to develop. Dryness also makes your skin itch. To combat it, apply a moisturizer about five minutes before the foundation or powder. A hydrating foundation or powder will also help. Many people who wear makeup never get a single pimple. So while it's incorrect to say that makeup can cause acne, it can make it flare up if you already have blemishes. A pimple is a hair follicle plugged with oil and dead skin cells combined with adverse bacterial activity. When you wear foundations and powders that clog your pores and hair follicles even more, you can aggravate acne. The AAD recommends avoiding oil makeup and using non-acnegenic or noncomedogenic makeup, which won't block your pores. Some makeup ingredients such as fragrances and preservatives trigger allergic reactions, including contact dermatitis. 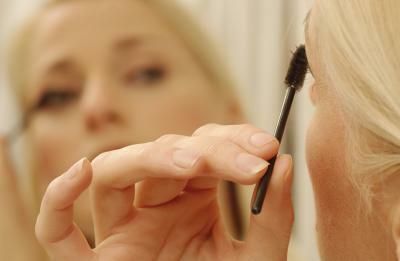 Preservatives in makeup include parabens, which have been detected in cancer cells. Also look out for formaldehyde -- mostly known for preserving corpses, it can irritate your eyes and skin.